*Lots of photos today, so more collages. For me, today felt like a long day. 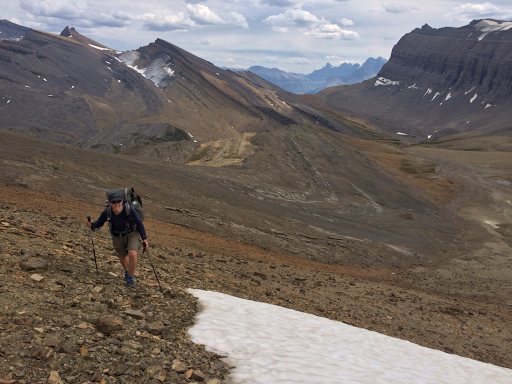 The last four days were basically level with little elevation change, and today we got back into the climbs and descents…while carrying 7 days of food. I was definitely tired at the end of the day. Both of us didn’t sleep well last night and had some digestion issues with something we both must have had at the Crossing. It would have been the fries or the ice cream. Thankfully, it improved for both of us as the day continued today, but it made me kinda groggy today. 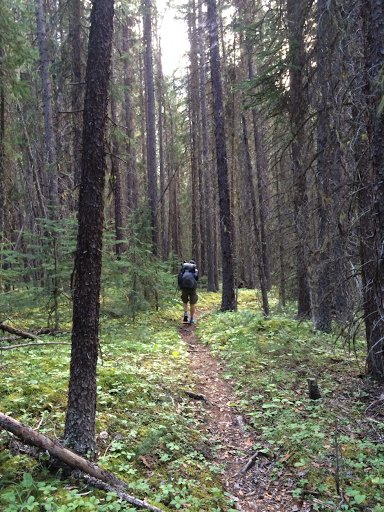 We got going by 6:40am this morning and had a short hike to get to the Owens Creek Trailhead. When we got there, we saw a truck parked with a GDTA sticker on it. We hoped to meet whoever it was as we hiked in. The GDTA did trail work along this section a couple weeks ago and it was great to have clearer trail and blazes to indicate where to go. THANK YOU GDTA! Partway up, we stopped for out daily morning break and E’s breakfast stop. 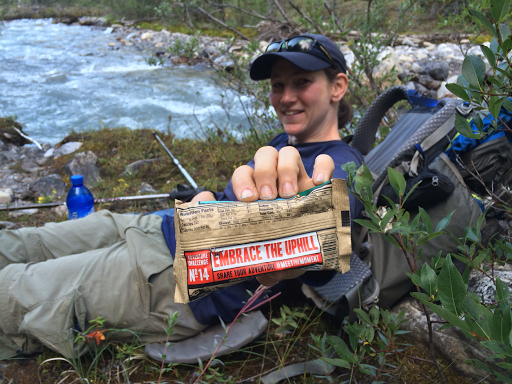 I ate a Cliff Bar and the message on the back read, “Embrace the Uphill.” What a perfect message for today. The majority of the time today was spent on tiring uphills and we were headed to the GDT highpoint. E loved this section and easily hopped rock to rock and glided across the inclined scree of the washouts. The GDTA said they did what they could, but would have to return to do some work on the washouts. This kind of stuff with a heavy pack is not my specialty. I was shaking much of the way and unstable. With rock hopping and angled terrain over an extended period of time, I get freaked out about my ankles and feel unsure of every step. 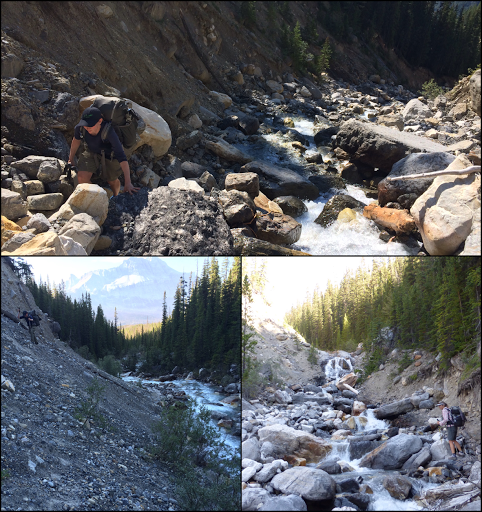 The loud and fairly strong Owens Creek below didn’t seem to help the nerves. E was very patient waiting for me as I froze on certain parts and had to get my act together. I think this wouldn’t be so difficult for most people, but it is for me and my wobbly ankles with a heavy pack. Most of the way up the creek, we met the owner of the truck with the GDTA sticker. It was Canadoug who was out for an overnight and was part of the trail crew that did work on this section a couple weeks ago. It was great to meet him! 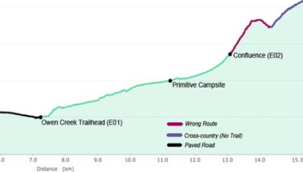 He did the PCT in 2009 and I immediately asked if he knew, Why Not who also hiked it that year and did this Tahoe Rim Trail with me this summer. He said Why Not and her hiking partner Why Wait were the ones that gave him his trail name! What a coincidence! Canadoug gave us tips on what’s ahead and is also going up to do the final section of the GDTA that’s pretty remote this coming week. He’s going to give us a report on what to expect. 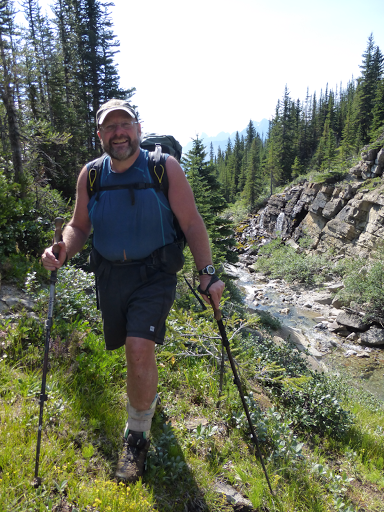 It’s a 9 day stretch most hikers don’t do because of how remote and unknown the hiking is. It will be great to get beta from him on that last stretch when we hit town in a week. 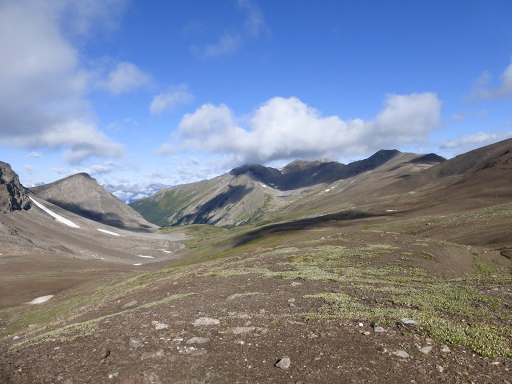 We finally made it up Owens Creek to Zinger Pass around 1pm. 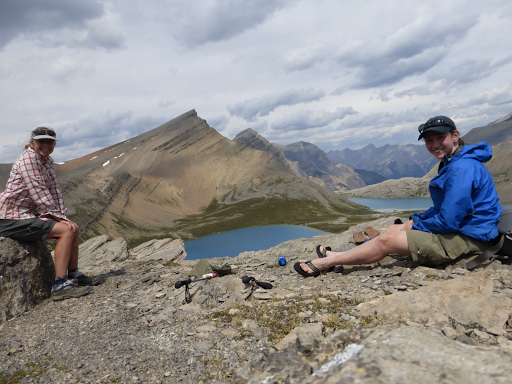 We decided to go for a late lunch at a spot Canadoug told us about just up off the trail. 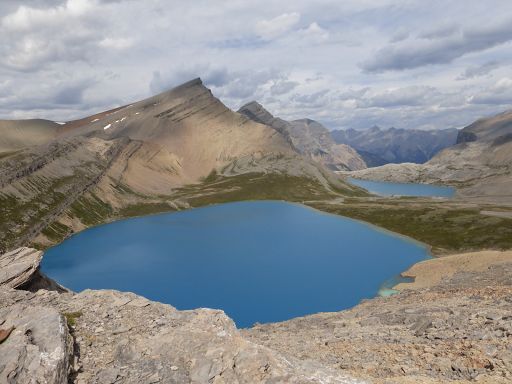 He told us that one of his favorite views was just over the pass and to stay high rather than taking the route down to the valley. Within 10mins or so, it a great view looking down on Michelle Lakes, which the GDT kinda skits by. He was right! It was a great spot! The color of the lakes was unbelievable. It was like looking down into the sky. 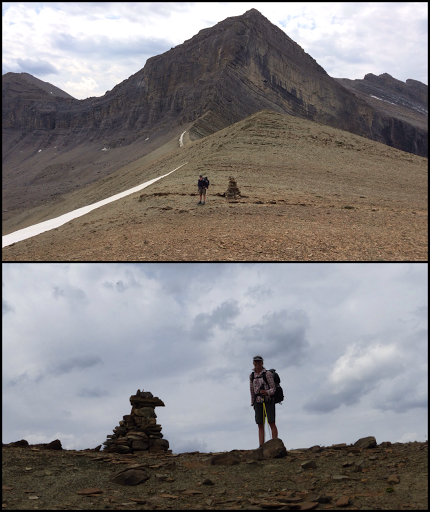 From lunch, we headed toward Annesley Pass, the GDT highpoint at 8497ft/2590m. 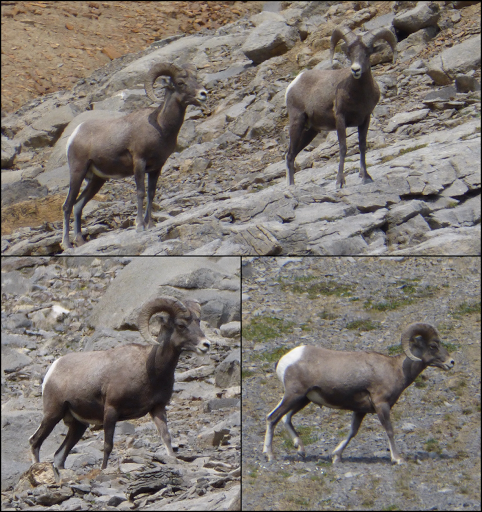 On the way up, we saw two bighorn sheep that just moseyed right across the trail and then grazed as we hiked up. We watched them for quite awhile. I had to zoom in, so they aren’t as clear as they could be. From Annesley, we dipped down into a valley to then go over CTM Pass. This one was the most puzzling to figure out. From the top of Annesley, it appears that there are many ways to go, but we couldn’t see our final destination, so that’s what made it confusing. There were many notes from previous hikers and it was still kinda confusing. Fortunately for us, the GDTA had just been through. There was a cairn placed at the bottom of the valley and orange blazes on skinny trees over the creek indicating where the hidden trail goes up. 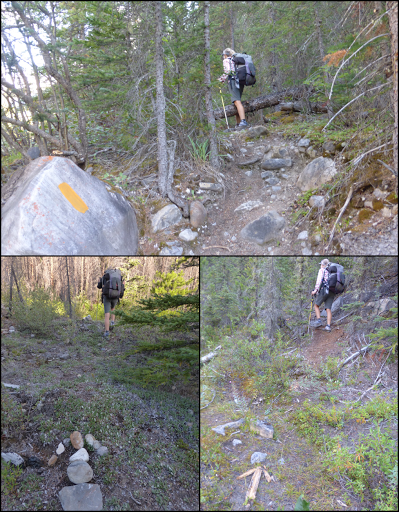 Once we found it, it was clear and easy to follow steeply up. We broke out of the trees to a great views the rest of the way up. 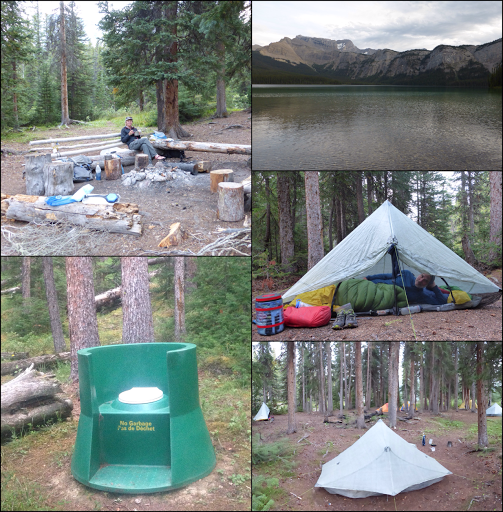 The next two hours was a winding downhill dive into a dense forest that led to our camp for the night Pinto Lake. There were also three girls we knew were just ahead of us this afternoon and somehow we passed them on the last pass without knowing it. Turns out, they too were confused by CTM pass and ended up cross countrying it through the woods and having quite the adventure. They were fun gals and we could totally see them thru hiking someday. Ok, I’m wiped out. The miles don’t reflect how physically demanding this day was.